This I made for Molly, my best friends niece. Shes about to lose her first tooth. 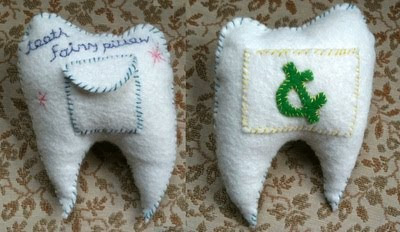 So this tooth shaped tooth fairy pillow she can put her tooth in the front, then when the tooth fairy comes she can leave the money or treat in the pocket on the back. I wish I had one of these when I was young because I would always have to tear my bedding apart looking for my tooth fairy money because I moved around so much in my sleep. yeah, that's awesome. Molly loves it too.